The Italian verb for dip is the regular -ARE verb inzuppare. ... imagine dipping bread IN SOUP! Inzuppare is conjugated like thousands of other regular -ARE verbs. Inzuppare can also mean: to dunk; to soak, to drench; percolate. - inzuppare (vr) : to get drenched, to get soaked. - inzuppato (adj) : soggy, wet, soaking, soppy. - la zuppa (nf) : soup; muddle, mess (fig) ; drag, bore (coll). 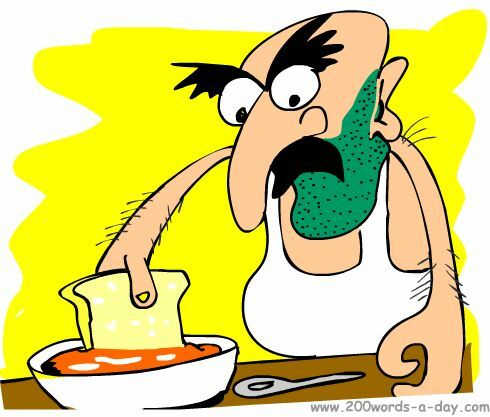 - (fare) la zuppetta (nf) : to dunk (ie bread, biscuits into soup, tea). Dip into learning Italian with innovative memory techniques like Cartoon Memory Triggers. To remember a word, just think of the pic! Imagine dipping bread IN SOUP! care! non inzuppare! (non) inzuppi! (non) inzuppiamo! (non) inzuppate! (non) inzuppino! ✔ Inzuppare is a regular -ARE verb, these being the most common verbs in Italian. ✔ Learn inzuppare and it will reinforce the pattern for ALL those other -ARE verbs. ✔ You can more easily remember words and verbs like the Italian for dip - inzuppare using the techniques of the world's Memory Masters. 200 Words a Day! Free Daily Italian Lesson Online - the verb in Italian for dip is inzuppare - fully conjugated. Italian Learning Made Fun and Fast with your free Daily Italian Verb Lesson - inzuppare.